Our city is considering ordinances to control mobile food purveyors. One grouping that they are defining they have named “food courts”. These are areas where multiple food trucks congregate. Note the area in yellow. They want restrooms. I guess that requiring small business people to build restrooms in a transient area somehow makes more sense than requiring the city to build them in a permanent public park like San Jacinto. This entry was posted on Thursday, December 8th, 2016 at 5:00 AM and is filed under City government. You can follow any responses to this entry through the RSS 2.0 feed. You can leave a response, or trackback from your own site. Yep. Right on the money. I want to see a Pink Store food truck serving up Yvonne’s Palomas margaritas on a hot June afternoon. Yummmm…who needs a pottie after three or four! Just water the shrubbery in San Jacinto. So what the “Royal Court” of two-bit Dictators on Silly Council are actually doing, intent or not, is to put these small business people OUT of business. There is not ONE of these two-bit Dictators that should be left on Silly Council the next time they come up for election. THEY have never had a real job, just professional, career politicians. Just like our National election, WE have to remember what THEY have done to US and get rid of THEM. Don’t forget that the plans for San Jacinto actually included a cafe to be leased out by the city, yet the city intentionally chose not to not include restrooms in its San Jacinto improvement plans. They even defended that decision when the restrooms issue was raised. The city said they left bathrooms our of the San Jacinto plans because they were cost prohibitive, but they have no trouble imposing additional costs for bathrooms on private sector projects. This is a classic example of double standards. The rules apply to us, but not to them. All the things on that food court requirements list add up to substantial dollars, plus a larger property. Why do I get the feeling the requirements are intended to discourage these projects? Maybe the El Paso Restaurant Association has friends on city council. We as taxpayers are not asking for luxuries only for basic necessities such as restroom facilities in San Jacinto Plaza, fix our streets, more police officers, etc. Instead City Council is “investing” taxpayers’ money in beautifying our City and harassing taxpayers. It is very obvious that City Council friends are benefiting from all these investments and not taxpayers. A perfect example is our current City Hall building locations. We did not benefit from moving City Hall to old buildings, only Mountain Star investors. Aren’t these the same people that have big plans to open up new restaurants in the downtown area? What location(s) are popular this month for mobile food trucks . . .or this year, will NOT be popular. . . or used. . .NEXT year. The food trucks do NOT own or lease the property they temporarily occupy. Many food trucks sit for a couple hours on a city owned STREET. So, if that’s the case. 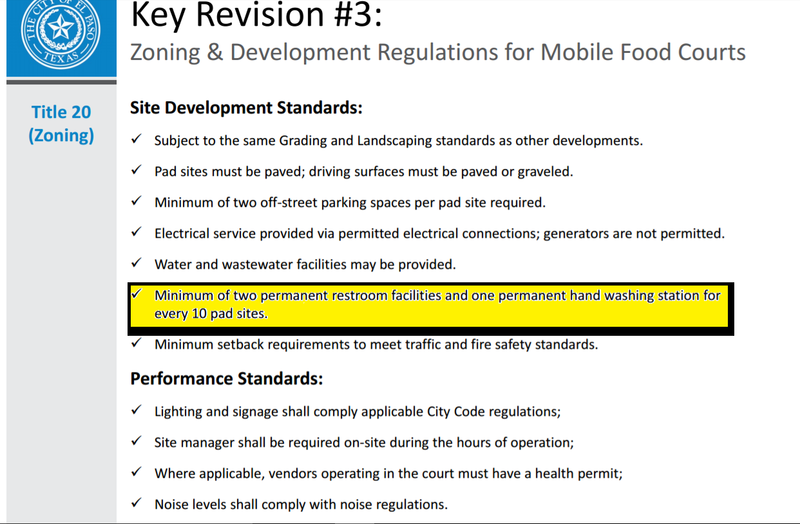 . . the CITY would be required to build restrooms wherever a food truck stops. The food trucks are usually at a single location MAYBE twice a week. NOT all week. Sooooo, stupid idea of the week. That MIGHT also mean that restaurants that offer carry-out, take-out, like Wendy’s or McDonald’s might have to build a restroom in the parking lot or the parking lot NEXT door, if people carry their food over there to eat. I still have pot holes all over my street and it has the original surface from 40 years ago . . . HELLO, there are other things that are more important ! The city will yet ruin the food truck business. They are turning them into a permanent restaurant when their success lies in being mobile. Used to love that food truck on the corner in my neighborhood but, alas, now they’re gone, courtesy city harassment. The point here is that logic, normal rules, LAWS do not apply to the politically corrupt of El Taxo. Just one big criminal enterprise with inherent corruption, Silly Council. Privatization of “public” restrooms. It had to happen sooner or later.